Reference number for this case: 16-Oct-54-Aubenas. Thank you for including this reference number in any correspondence with me regarding this case. 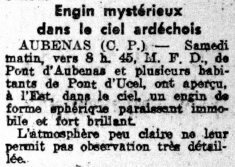 AUBENAS (C.P.). -- Saturday morning, around 8:45 a.m. Mr. F.D., of Pont d'Aubenas and several inhabitants of Pont d'Ucel, saw in the east, in the sky, a machine of spherical shape appearing immobile and very bright. 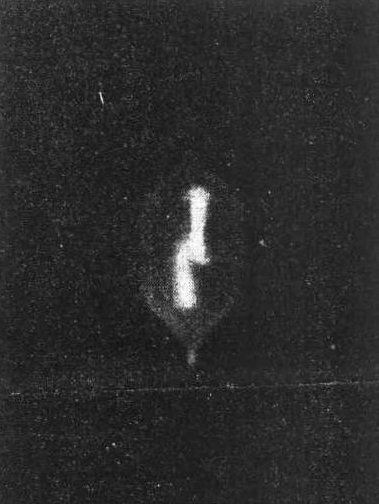 The not very clear atmosphere did not allow them a very detailed observation. Pont d'Aubenas and Pont d'Ucel ar4e district of the city of Aubenas, 44° 37' 14" N, 4° 23' 28" E.
Vénus was not visible then, but a bright star, or a balloon, could be the explanation. 1.0 Patrick Gross January 26, 2017 First published.